Vandalia and Butler Township Fire personnel participated in an emergency operations drill on Friday on Kenbrook Drive and Perry Street. 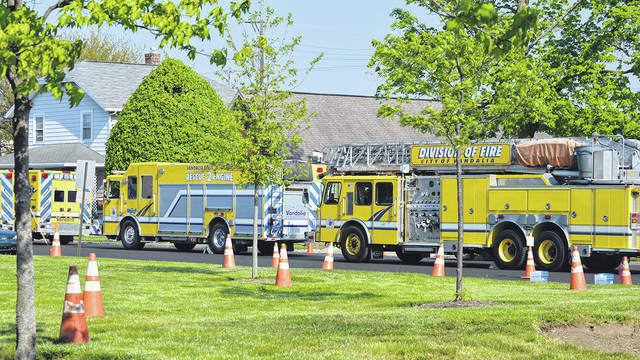 Orange cones were meant to signify injured persons during an emergency operations drill on Friday on Kenbrook Drive and Perry Street. 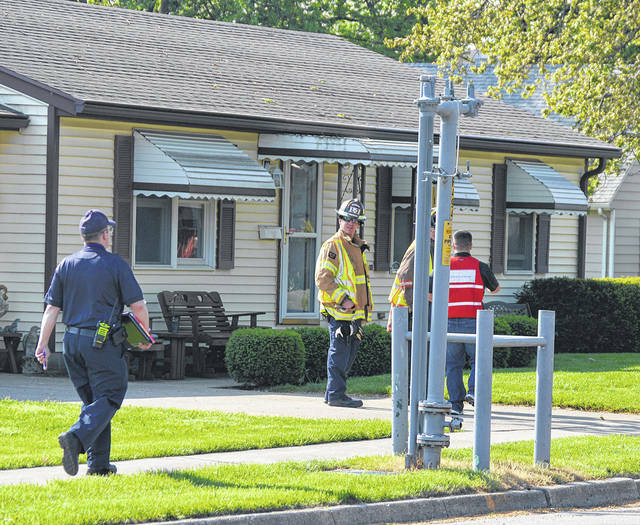 Vandalia and Butler Township Fire personnel simulated going door to door for evactuations due to a natural gas leak during an emergency operations drill on Friday on Kenbrook Drive and Perry Street. Vandalia Police Chief Kurt Althouse (left), Fire Captain Steve Milliken (center), and City Manager Jon Crusey hold a mock press conference as part of an emergency operations drill on Friday. The City of Vandalia’s Division of Fire conducted an emergency operations drill on Friday on Kenbrook Drive and Perry Street. In the scenario, this vehicle had driven through the Vandalia Farmer’s Market striking many pedestrians and damaging a natural gas main relief system. VANDALIA — It’s a nightmare scenario, but one first responders around the globe are focusing on. It’s a crowded Friday night at the Vandalia Farmer’s Market and, out of nowhere, a car comes plowing down the street at a high rate of speed. People flee, but not fast enough and dozens are injured. Complicating matters, the vehicle, which flipped on its top, has struck a gas main relief system causing a significant natural gas leak and explosion danger. That was the scene Friday morning on Kenbrook Drive and Perry Street as the Vandalia Division of Fire held an emergency operation drill. Behind the scenes, at the Justice Center and the Municipal Building, dozens of city staff sprang into action while activating the Emergency Operations Center (EOC) in the basement of the city building. It was the city’s first full-scale exercise since 2008. Follick said the drill had three top objectives that included public information and warning, control and command, and situational awareness. City Manager Jon Crusey, who was the overall coordinator of the EOC, agreed. “We found a lot of things we do well and a lot of things we need to work on,” said Crusey. One of those things was the role of the Public Information Officer (PIO). Communications Manager Rich Hopkins, who would likely serve as the PIO in a real emergency, said instead of being on the scene of the emergency, as he was on Friday, he would likely remain at the EOC. Thankfully, Friday’s exercise was just that – not the real thing, a scenario none of the participants hopes to see. The city’s Emergency Operations Plan (EOP) is set up in a three year training cycle that includes a review of of the EOP and its policies in year one. The second year includes a tabletop exercise in a meeting with participants. The third year will include a full-scale, hazard specific scenario which is staged to exercise specific parts of the EOP. “This (drill) is kind of like buying insurance – its our plan but we hope it never happens,” said Crusey. https://www.vandaliadrummernews.com/wp-content/uploads/sites/19/2018/05/web1_3-2.jpgVandalia and Butler Township Fire personnel participated in an emergency operations drill on Friday on Kenbrook Drive and Perry Street. 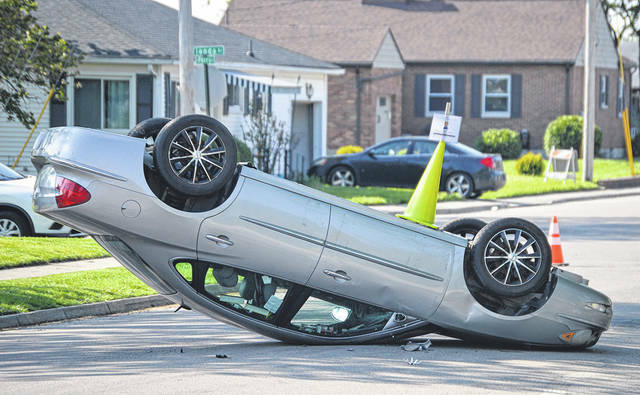 https://www.vandaliadrummernews.com/wp-content/uploads/sites/19/2018/05/web1_5-1.jpgOrange cones were meant to signify injured persons during an emergency operations drill on Friday on Kenbrook Drive and Perry Street. https://www.vandaliadrummernews.com/wp-content/uploads/sites/19/2018/05/web1_6-1.jpgVandalia and Butler Township Fire personnel simulated going door to door for evactuations due to a natural gas leak during an emergency operations drill on Friday on Kenbrook Drive and Perry Street. 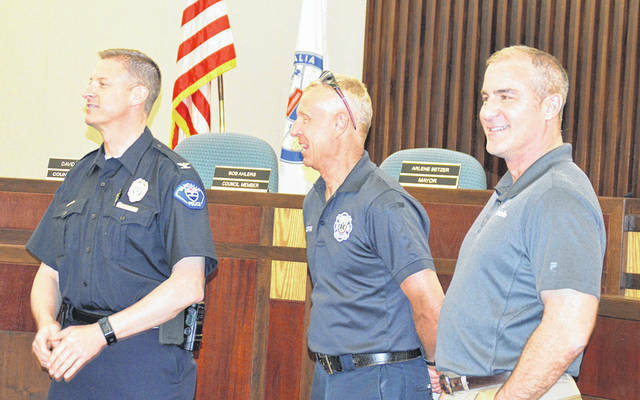 https://www.vandaliadrummernews.com/wp-content/uploads/sites/19/2018/05/web1_7-1.jpgVandalia Police Chief Kurt Althouse (left), Fire Captain Steve Milliken (center), and City Manager Jon Crusey hold a mock press conference as part of an emergency operations drill on Friday. 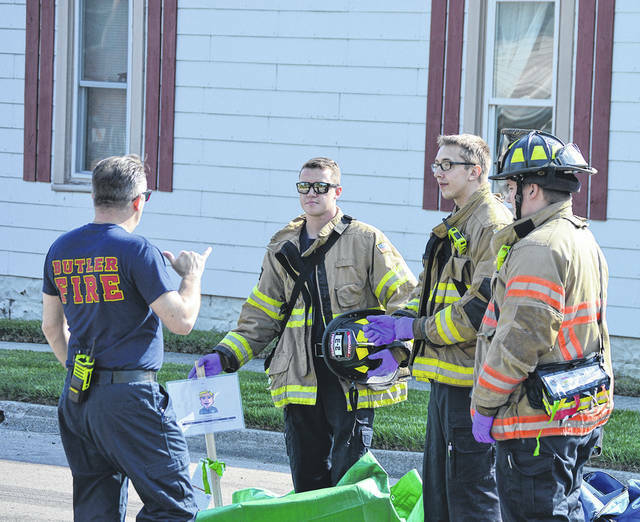 https://www.vandaliadrummernews.com/wp-content/uploads/sites/19/2018/05/web1_2-1.jpgThe City of Vandalia’s Division of Fire conducted an emergency operations drill on Friday on Kenbrook Drive and Perry Street. In the scenario, this vehicle had driven through the Vandalia Farmer’s Market striking many pedestrians and damaging a natural gas main relief system.